"The Queen and I" (sitcom) and "Ben Casey"
 Breaking Point: SOLO FOR B-FLAT CLARINET Pt. 2. Writers Meta Rosenberg, Jerome Ross. *Note: This was a historical moment in television with the first use of the word "homosexual". Neil Simon's play "Barefoot in the Park". Next choice was Dean Stockwell who was cast but a few days later his agent called and said that Dean had a change of heart. Next up for the role was Michael Parks, Lynn Stalmaster the casting director exclaimed he was a hot new young actor. A senatorial candidate's political chances are threatened by his wife's emotional breakdown. [--] 25Nov1963 Episode rescheduled to 06Jan64, President Kennedy's Funeral. Breaking Point: WHO IS MIMI? - WHAT IS SHE? Though Mimi Casell is a grown woman, she can't control her tears when critics ridicule her fading idol. A man is plagued by guilt for his participation in the atom bombing of Hiroshima over 18 years ago. [--] Breaking Point: 03Feb1964 - pre-empted for the Winter Olympics. A patient's revelations about his family organizational activities jeopardize his girlfriend and Dr. Thompson. A young trapeze artist is mysteriously unable to walk following her father's accidental plunge to death in the big top. Dr. Thompson is faced with a difficult decision when a patient's pregnancy prohibits the usual treatment for her catatonic condition. difficult decision for the patient is an expectant mother and the usual treatment would interfere with the pregnancy. A perfectionist attempts suicide when beset by midlife anxieties despite her "perfect" marriage. A boxer fears that he will inherit his fighter father's reputation in the ring. Afraid of being accused of taking a "dive". 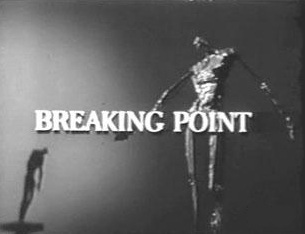 [--] Breaking Point: 13Apr1964 ABC Mon - pre-empted for the Academy Awards. A loan shark experiences a "stigmata" in the form of bleeding palms to the consternation of his priest. is an unscrupulous money lender intent on setting his church in panic when one day he discovers blood spots on his hands.